Jane Wyatt was raised in an upper-crust New York family and educated in private schools, so her parents were not pleased about her decision to become an actress. Pretty and petite, Wyatt had only six months of dramatic training when she made her Broadway debut at the age of 20. She had been listed in the New York Social Register until then, but when she became a working actress she was promptly de-listed. She soon became a prominent film actress, with credits including the utopian original Lost Horizon, the courtroom drama Boomerang, and the stirring statement against prejudice Gentleman's Agreement. 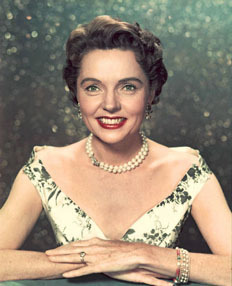 Wyatt is primarily remembered for playing Margaret Anderson, family matriarch on the long-running situation comedy Father Knows Best. In each week's episode, someone in the family faced an overblown problem, and within half an hour Father (Robert Young) somehow made everything OK, sometimes with help from Mother. Wyatt was the stereotypical suburban housewife, and she was always proud of the program's "family values". In her later career, she had a recurring part on St. Elsewhere, and her fame was unexpectedly resuscitated when she played Amanda Grayson, Spock's mother on the original Star Trek. Nearly twenty years later, she reprised the role in the film Star Trek IV. Hollywood Walk of Fame 6356 Hollywood Blvd.